This comes to you late at night from the Doncaster-Leeds flyer, the last stage of an epic journey which has included a marvellous spell in and around Peterborough with George Barker, a titan of urban wildlife enthusiasm in the UK, and then a trip on a 'bat punt' in Cambridge with that city's excellent batman, Iain Webb. All will be explained in due course. Iain and the punt poler Nick Ross-Lewin were chatting as we glided along in the dusk about what they called the 'arms race' between radar stealth weapons employed by both bats, the hunters, and moths, their prey. Here from last night's trap catch is what looks like a powerful weapon in that fight, the delicate set of antennae on a Willow Beauty. 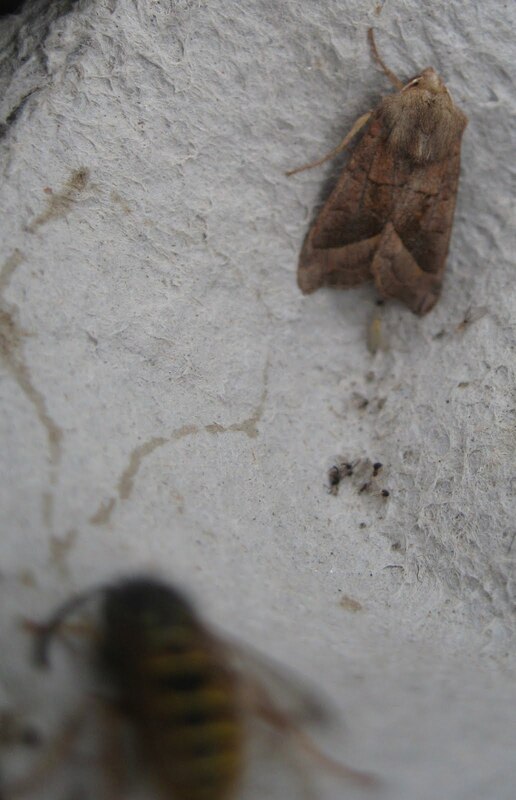 Here's the same moth seen from above, accompanied by one of the snails which fearlessly ascend our garden furniture and sometimes even the house. Also dozing away was this very pleasant Rosy Rustic, unaware how close it was to a wasp - fortunately equally dopey. But now we are passing Elland Road, so I must post, shut down, unplug, go home and sleep. Night night. 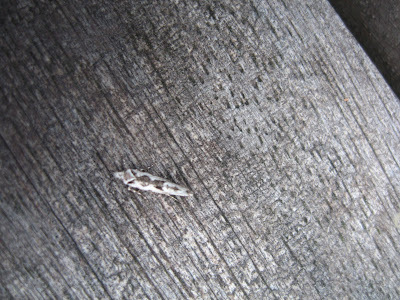 Here's a nice moth - the sort that keeps me trapping as the nights draw in, the dawn comes later and the wasps abound. 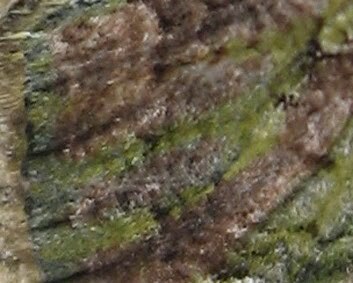 I'm 99 percent sure that it's a Green-brindled Crescent of the form capucina, an endemic British creature, only found here, hooray, tarantara. (The capucina, that is; the standard GBC is continental too). So of course are the cappuccino and Capucin monks after which it is named. 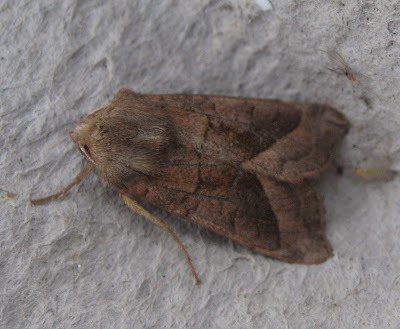 Both share the name because of their combination of dark brown and cream, in the monks' habits and the nice drink, and the moth variety has that look too, with its greyish 'head' and brownish body - although as you can see, 'brown' is a simplification. 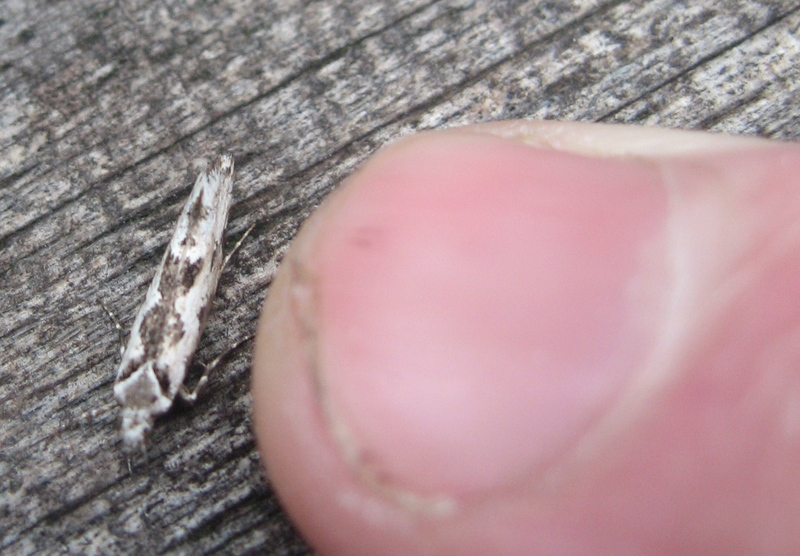 It's a terrific example of the rich but subtle variety of colouring which is one of the great attractions of moths. I put the trap in a new and very shady area by our pond, btw, with brambles close by. The devil has just about got into the blackberries now and that figures; my moth Bible tells me that the GBC enjoys feeding on over-ripe ones. More of the trap's inhabitants soon... Meanwhile, can anyone confirm to me why cappucino has two ps and Capucin one? Penny thinks it's to do with the former being Italian and the latter Latin. Erudite soul. Early nip of changeful autumn wrote Betjeman and that's what we've got now. Beautiful sunshine and warm days, lovely leaf colours but cold nights and ragamuffin moths, elderly, worn-out; they've seen better days. Even the new ones are sombre, like these three Dark Prominents (Eh? Have I gone mad. Yes. See Comments. There's no such moth. They're Black Rustics which I've often featured here. Age...), lined up in the manner of secret American weaponry on Area 51. So let's cheer up with one of the Red Admirals which are still enjoying the sunshine, and the last fronds of our buddleias which I keep clipping to encourage fresh growth. Soon the frost will come and it will all be over and I will pack up the trap and say farewell until the Spring. Another tiny this morning. This time I remembered to include something for scale, though Penny pints out that readers won't know how big my thumb is (that large pink blob). You have to remember to look hard in the increasingly scanty trap these days. Otherwise I would have missed these two micros, each the size of the average length of lead which shows on a well-sharpened pencil. I know that the first one has previously been identified for me by helpful experts and the second one may have been too. I shall spend what spare time I have this weekend checking back, or on the usually fruitful distraction of typing 'micro moth' into Google. Check out the latter's Sesame Street logo today (Sat, 24 Sept, btw). I've said before that micros are a retirement project. I just hope that my eyesight or spectaclemakers' expertise makes that possible. My mother-in-law (92) is a member of the Worshipful Company of Spectaclemakers so I shall ask her. The Comma has a striking silhouette, easily the most raggedy of the UK's butterflies. This one obligingly posed in a way which strikingly shows its comma too. The dark backdrop to the underwing shows that it is one of the second brood which goes into hibernation fairly soon, although mild weather can wake them up to flutter about during the winter. I think it must have hitched a lift into the Guardian's Leeds office (aka my shed) because I'd only just sat down when it appeared, fluttering so wildly at the window that I thought it must be a moth. Bit early to hibernate, I told it, capturing it neatly in my hand and bunging it out into the sunshine where it soared away. The Comma is another butterfly success story which casts doubt on the regular prophesies of doom for the UK's limited number of species in the media. Its numbers dwindled in the early 20th century but it staged a sturdy comeback and is almost always around in our garden from the late spring to mid-autumn, provided the sun shines. Not for the first time, I recommend reading an excellent article about the Comma and a Victorian vicar's wife, Emma Hutchinson, in the newsletter of the West Midlands branch of the Butterfly Conservation Society. The magazine is called The Comma in her and the butterfly's honour. Two magpies beat me to the trap this morning but unlike a sparrow two years ago, they were far too big to get in. They wouldn't have found much if they had, but there was a Silver Y, a full-size one unlike the mini variety gammina which intrigued me the other day. 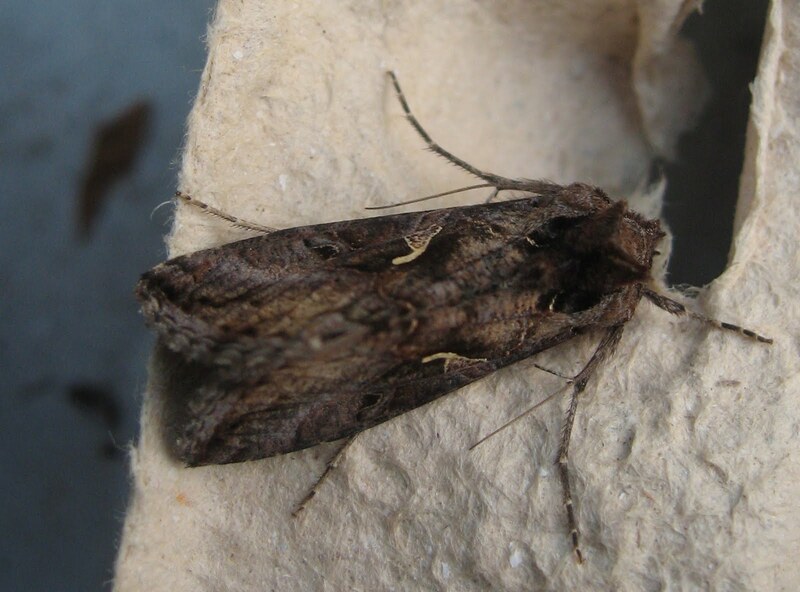 In their helpful comments on that post, Nick and Stewart said that 2011 was proving a poor year for Silver Ys, which used to be the common moth when I was young, largely because it flies by day as well as night. So here's another picture to cheer everyone up. Alongside this in the trap were five large yellow underwings in varying stages of dilapidation, a daddy-longlegs and this, below. Is it a caddis fly? Almost instant update: I've just Googled - including some slightly gruesome pics of fishing fly bait - and I'm sure it is. Gloomy mornings, always a bit of overnight drizzle, too many wasps... I can see the end of the season approaching. Not yet, though. The main inhabitants of the trap this morning were assorted yellow underwings and half-a-dozen Copper Underwings, all looking much the worse for wear, but there was also a refreshing gleam of orange and yellow. The orange came from this Frosted Orange, another moth which my guide describes as liking 'disturbed weedy places' and which is therefore at home chez nous. It's balding like Prince Charles but the wing pattern is still a joy to behold. Time has also taken its toll on the mops of these two Sallows (I am pretty sure that's what they are), but they remain lovely as well. The second one is perching on the trap cable which, as Penny observes over our morning tea, helpfully gives scale. I had an interesting expedition to Wharncliffe Heath nature reserve in the steel-making valley of Stocksbridge the other day. I got thoroughly lost which is always an interesting experience in our crowded little island. Because of the crowding, it never bothers me as you're bound to find a house, road or slightly suspicious local soon enough; and in the end I got the complicated landscape sorted, saw a stoat, possibly one of its victims (gruesomely non-Beatrix Potter photo left), millions of Speckled Wood butterflies and a fine dragonfly pond. The dragonflies were extremely restless and a big reddish one with notably clicking wings, which particularly interested me, kept far beyond the reach of my camera. By dint of just pointing and shooting from my sunlit perch on the old dam, I managed to get this blurry Southern Hawker in flight, though, plus the red damselfly (I think) right, which did have the courtesy to stop. The stoat was far too clever for me, so here's a Speckled Wood instead. Actually they're toadstools, or at least I think they are. 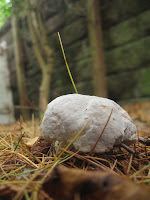 We're heading rapidly for Keats' season of mists, mellow fruitfulness - and fungi. There are lots of trees round us and up the toadstools pop at this time of year; incredible that such large objects grow at such speed. Specially compared with lichen. Penny and I are devoted members of Leeds Phil & Lit and we're always attending lectures on everything you can imagine. This week it was Prof Mark Seaward from Bradford who has spent much of his life examining them. The talks are almost always very cheery, accessible and accompanied by props and this was no exception. Mark brought along a wondrous range of health, beauty and other products in which bits of lichen play a supposedly magical but probably spurious part. This is a shame because lichen grows at such a snail's pace, and although there seem to be carpets of it everywhere, mankind can alter that double quick. Anyway, here are three fungi which I will spend the weekend leisurely trying to identify in my toadstool Bible, which I love because of the thrilling skull and crossbones symbols by the ones - only a handful in the UK luckily - that can kill you. I met a very nice man the other day, Joe Kent, who once had an even nicer job title: Head of the North. This was for Homeless Link, the excellent charity tackling rough sleeping. Joe still works for them but internal changes mean that he now has a wider a brief but a less romantic title. 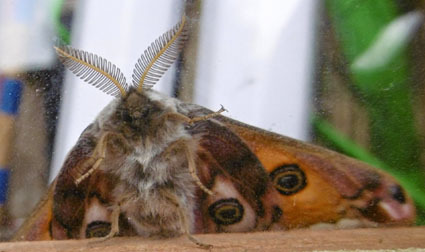 We met at a talk I gave in Knaresborough about my book True North (a fine Christmas present, even for moth enthusiasts...) and I have added 'Head of the North' to my anecdotage. Every company should have one. "The heath tonight appeared to be totally deserted; and Wildeve, after looking over Eustacia's garden gate for some little time, with a cigar in his mouth, was tempted by the fascination that emotional smuggling had for his nature to advance towards the window, which was not quite closed, the blind being only partly drawn down. He could see into the room, and Eustacia was sitting there alone. Wildeve contemplated her for a minute, and then retreating into the heath beat the ferns lightly, whereupon moths flew out alarmed. Securing one, he returned to the window, and holding the moth to the chink, opened his hand. The moth made towards the candle upon Eustacia's table, hovered round it two or three times, and flew into the flame. Eustacia started up. This had been a well-known signal in old times when Wildeve had used to come secretly wooing to Mistover. She at once knew that Wildeve was outside, but before she could consider what to do her husband came in from upstairs. Eustacia's face burnt crimson at the unexpected collision of incidents, and filled it with an animation that it too frequently lacked." It must have made an impression on me to remember as I haven't read this book for over 25 years! It certainly makes an impression me. Gloomy old Hardy, what an image... Mind you, the biography of him by Claire Tomalin is absolutely excellent. Now, we'd better have a moth. This one flew into our kitchen last night, although not into the candle which we romantically light to have with our supper. I am still working on what it is (the colouring is highly misleading) but do you think it was a signal from some equivalent of Wildeve outside? Update: my best guess so far is Angle-striped Sallow, although they are not so common. All help appreciated. I first heard that fashion rule when HM The Queen visited Bath when I was a young reporter there and she excited much comment by her defiance of it. The Red-green Carpet is more obedient, or conventional. 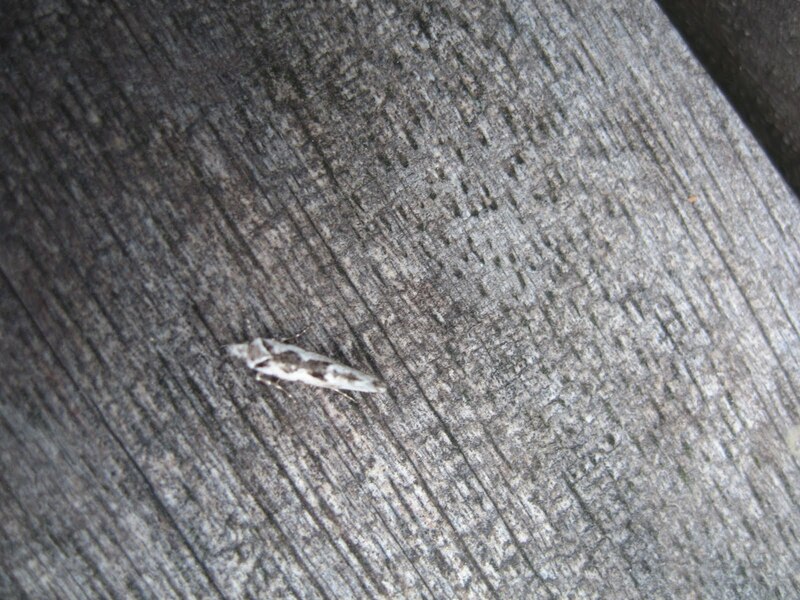 It's a moth which appears all over the country at this time of year, except perhaps for the Orkney islands where only one has ever been seen. As you can see, it's really the Brown-green Carpet and thus has lessons for camouflage, although perhaps ones which the experts have known for a long time. I remember painting my Airfix kits of a Spitfire and a Lancaster bomber in almost exactly this patterning. Here's the wing closer-up, although I've not yet mastered focus at this level so it looks more like a blurry reconnaissance film from one of the above aircraft. One feature of the Red-green Carpet is a patch of flaky white at the tip of each forewing, as if the moth has had a brush with chalk or a board-rubber. Here's that close-up as well. More unsettled weather, though the winds have died down. So only a few moths, and most of them predictable. 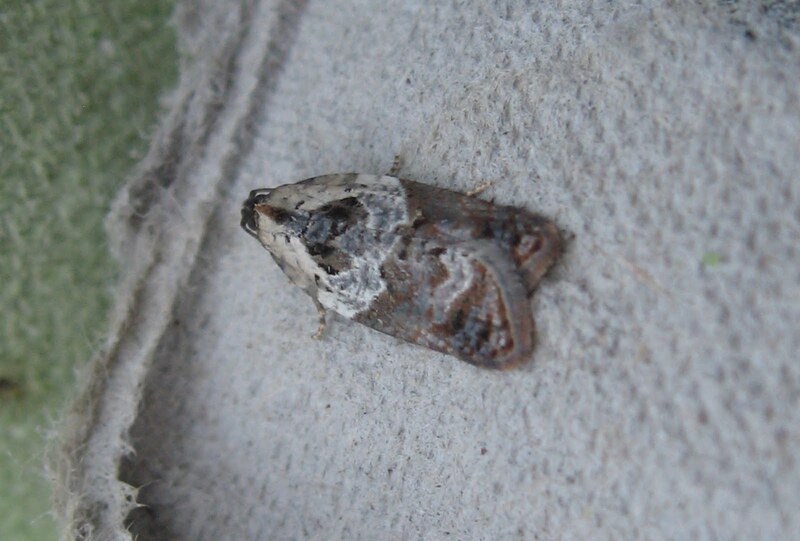 This one interested me, however: it's only a Silver Y (I'm 90 percent sure, although I get muddled by the rather similar Golden Y and Beautiful Golden Y), but it seemed unusually small. Since you may not be familiar with the size of a Sainsbury's 'Taste the Difference' eggbox, and since the moth was peacefully sleeping, I took it inside and lined it up with Penny's old printer's ruler, from her days as chief sub-editor of Cosmopolitan. I could give you the measurement in points, but here it is in millimetres: 15. 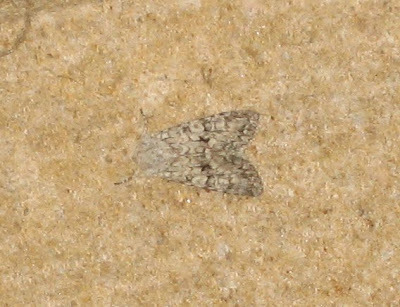 This suggests a Silver Y, whose forewing length is 13-21mm according to Waring, Townend and Lewington whereas the other two start at 17mm. Aren't I getting scientifc in my old age? Note, though, the different effects of light (a) outside and (b) in our kitchen. It reminds me of a mirror I once had in a hotel in San Francisco which showed how you looked in daylight, bright office light and subdued restaurant light. As I recall, the last was the most forgiving. Update: see very helpful comments which suggests that this is indeed a Silver Y, a small version due to starvation as a caterpillar known as 'gammina'. Might Hurricane Katia sweep in some rarities from America's vast stock of moths, like the Arctic Skuas and Manx Shearwaters which have been limping in to Slimbridge on the storm? No such luck, but hats off to this little Garden Carpet which was out and about in winds topping 50mph and probably higher. Plus a bit of rain; and I must say that the rain-shield on my trap, a simple plastic disc designed by the 1950s entomologists Mr and Mrs Robinson, is one of the most effective devices I have ever come across. I've included our fancy secateurs for scale, and colour, because the Carpet is a chit of a thing. Slightly bigger, and bearing the scars of either the storm or a long life, there was also this Rosy Rustic in the eggboxes. According to my moth Bible, it frequents 'gardens and disturbed weedy places'. Chez nous, it isn't always easy to tell the difference. A score of equally battered Large Yellow Underwings completed the hurricane haul, along with half-a-dozen wasps, one daddy-longlegs and nobbut a few of those flies which infested yesterday's post. Hurricane Katia is supposed to be flicking her tail at the UK, but to little effect in Leeds so far. It's blowy and damp but the trap's main menace this morning was gentlemen and ladies like the one on the left, with this Dark Arches. If I had a pound for each one etcetera... I think they must have been what was annoying this handsome Lesser Swallow Prominent which was beating its wing wildly under the transparent plastic cowl but settled down quietly on the rim of the bulb-holder as soon as I released it. It's reassuring that a bout of such violent behaviour has had little effect on the beauty of its wings and not dislodged too many of the scales responsible for that. I don't know what the flies are and would be interested if any reader does. Ditto with this strange beast on the left, with its Newcastle United legs and disdainful lack of interest in the fly and daddy longlegs behind it. We got home very late last night and for once had left our porch light on, so didn't have to fumble with the keys. Better still, the light acted as a moth trap on a warm evening and brought me a new species; this Grey Chi, with its pretty patterning and distinctive black mark reminiscent of the Greek letter Chi, helpfully shown right. It's basically our X and pronounced 'Kai' as in the Christian symbol, the Kai-Ro. The moth was rather high up, so sorry about the focus. This was just as well, because the moth trap this morning was so infested with wasps that I beat a retreat, and left its contents - yellow underwings mostly, so far as I could see - to sort themselves out undisturbed. I may go down later and have a braver look. Maintenant, le dernier bulletin de la France. 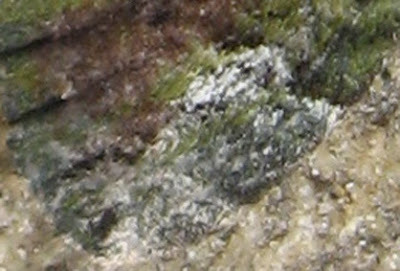 Can you spot the first of my non-moth French wildlife, below? Here he (or she) is in full. There were plenty of lightning-speed lizards, including a regular visitor which had lost its tail, that remarkable means they have of escaping predators. And finally a juvenile Western Whip Snake which had taken refuge in the beautiful old Romanesque church at Segonzac. They're not venomous but Penny and I didn't know that at the time; hence the photos taken from a respectful distance. Here's its scary-looking head. And with that, a bientot la France et merci pour les vacances fantastiques. Drizzle and a plague of wasps affect the trap, which anyway has little of joy other than some fine Copper Underwings. But who cares, because I have a little more French material to keep me typing happily away. This Small Copper is actually my last holiday butterfly, but I saw it in an interesting place: a museum of gourds at the hamlet of L'epalourdie near Bussac, a few miles from Perigueux, which we visited on our last day,in that slightly desperate way you do when you've got a few hours before the 'plane home. Le Jardin de Calebasse et Cie is run by an excellently enthusiastic artisan cougourdonnier who told us about Haiti's gourde currency and the way that calabashes were used as armbands when sea-swimming was first introduced at Biarritz. 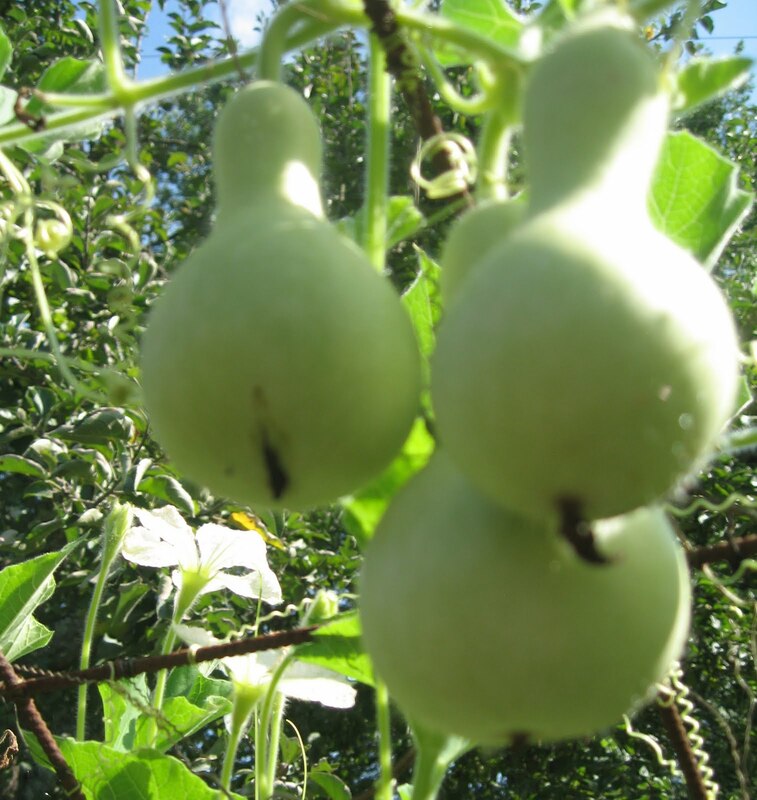 He also showed us this calabash which flowers at night - and is therefore pollinated by...MOTHS! You can read his explanation board below, because in my excitement I took a picture of it. 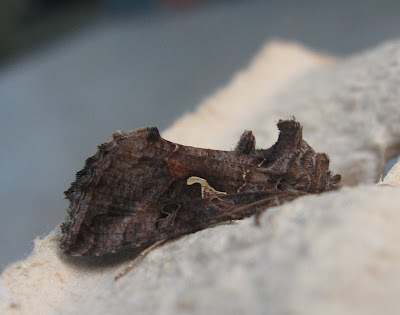 I was very pleased to discover this fact and will hope to find out more; I think that moths and other 'insectes nocturnes' as the cougourdonnier calls them, play a part in pollinating Nicotiana, Tobacco plants, which are so sweetly-scented at dusk. But I am not yet sure of my facts.